Religious faith is often described as a personal journey. Throughout life, people drift toward and away from religion, its importance waxing and waning with changing values, life events, and self-knowledge. For Alec Hufford ’17, the journey of faith has been more literal. A religion major and Jewish studies minor, he has traveled the globe, studying and working with people of faith in Scotland and Israel. His studies have given him insight into different religious cultures as well as his own personal beliefs. Growing up Jewish in Westchester County, he said the majority of people he knew were only nominally religious — they may have attended church or temple, but religion was not a major factor in their lives. It was in that environment that he became interested in the most devout groups in his community: Evangelical Christians and Orthodox Jews, and their relationship to the secular world. Visiting church services with an Evangelical high school friend, Hufford said he was surprised by the way the congregation envisioned its place in the community. It was the beginning of what would become a personal and academic interest for Hufford — the reaction of religious minority groups to living under a hegemonic majority. Arriving at Colgate, Hufford noted similar attitudes in the Evangelical community on campus. Both Evangelical Christians and Orthodox Jews sought to use their faith as a springboard to bringing positive change to the larger community. The main difference, he said, was that at Colgate the predominant religious attitude was skepticism, if not outright secularity. 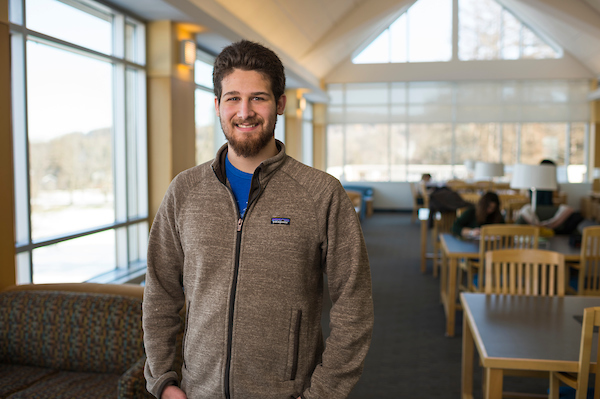 He quickly involved himself in Jewish and interfaith groups, and, as a Community Leader in the residence halls, became familiar with faith groups all around campus. He was intrigued by the different ways in which students of minority religious groups interacted with the broader, more secular campus culture. He began to form an understanding that, in minority religious groups that don’t face hostility from the majority, faith grows as an influence in members’ lives. He supplemented his own informal observations with rigorous scholarship in Colgate’s Department of Religion, which provided the formal background for his religious thought. Working with professors Yedida Eisenstat, Georgia Frank, and Jenna Reinbold, Hufford produced a thesis on the cosmological grounding of certain Hebrew texts. He also credited Colgate’s liberal arts curriculum with familiarizing him with philosophers other religious studies programs may not emphasize, such as Soren Kierkegaard. It was in one such program, when studying divinity at the University of St Andrews in Scotland for a semester through Colgate’s off-campus study group, that Hufford found himself in a very different religious environment, though he saw that some familiar dynamics applied. Attending one of the oldest and most prestigious colleges of divinity in the world, Hufford’s classmates at St Andrews were mostly theologically traditional Christians, though he said there was a divide between Protestant and Catholic students. The minority of Catholic students, though they tended to keep to themselves socially, weren’t afraid to voice their beliefs in classroom debates and discussions. Again, Hufford found himself fascinated by the behavior of the religious groups outside the mainstream. Last year, Hufford spent a summer in Jerusalem working with the Saint James Vicariate for Hebrew Speaking Catholics. He worked with and immersed himself in the impoverished migrant Catholic communities, helping working parents look after children and learning how growing up in this unique religious environment affected them. He recalled one boy from the Philippines, Emile, who, despite growing up in a devout Catholic household, insisted that he was Jewish and refused to go to mass. “It’s kind of like how Jewish kids in the United States want to celebrate Christmas. For him, he’s in a Jewish-majority state, so he identifies with that culture,” Hufford said. There are other quirks that stem from practicing Catholicism in Israel, as well — Hufford said he had heard of Catholic churches using traditionally Jewish matzah bread for the sacrament of Eucharist. Having graduated with honors in December 2017, Hufford plans to return to Jerusalem to continue his work with Saint James. He plans to return to school to obtain a graduate degree in religion, and, for now, he continues the observational research he’s been doing his whole life.